Lansing’s history with General Motors began when Olds Motor Works was established in 1897. Olds Motor Works began production of the Curved Dashed Olds in 1901. The company was purchased by GM in 1908. Over the years GM expanded production beyond the Lansing Car Assembly main plant and body shop. GM opened the Fisher Body Plant along Verlinden, a sheet metal plant on Saginaw Avenue and a service parts warehouse in Delta Township. After producing a variety of cars, ranging from the Toronado to the Cutlass 442, the Lansing plants began producing non-Olds vehicles in 1984. Although the plants were successful, they were not without their struggles, one of which was the fact that partially completed vehicles that began at the Fisher Body Plant (also known as Plant 6) had to be transported across town by truck to the Lansing Car Assembly Plant (known as Plant 1) to be completed. This was very costly and inconvenient. In 1996, GM announced that they would bring production of the new Oldsmobile Alero to Lansing, but that after production finished in 2004, GM planned to leave Lansing. The city faced the threat of losing local operations, resulting in the loss of thousands of high paying jobs, major tax revenue, and significant support for area nonprofits. Then Lansing mayor David Hollister decided to fight this decision, and teamed up with the Lansing Regional Chamber of Commerce to create the Blue Ribbon Committee to Keep GM. Mayor Hollister and Jack Davis, then chairman of the Chamber, co-chaired the committee and launched a public campaign entitled “Lansing Works! Keep GM,” to persuade GM to remain in the city. The Mayor and the City hired Capital Consultants (now C2AE) CEO and President Ray Tadgerson to serve as Project Director/Manager for the Committee. After months of research, problem-solving, collaboration, and negotiations, the Blue Ribbon Committee presented a detailed proposal to GM outlining the benefits of continued Lansing operations. Thanks to their efforts, a positive and long-standing GM/UAW relationship and strong support from the region, General Motors announced its decision to stay in Lansing. GM built three new plants in the region over the next seven years: Lansing Grand River Assembly in downtown Lansing and the Lansing Delta Assembly Plant and Regional Stamping Plant in Delta Township. In the years that followed, however, the community’s memory of the historical “Keep GM” effort began to fade. In 2012, David Hollister and Ray Tadgerson reconnected and discussed writing a book or creating some form of interactive resource to tell the story of the campaign. Hollister and Tadgerson brought the project to Terry Terry, president of local production company MessageMakers, who suggested the story would make for a compelling documentary feature film. Terry, MessageMakers, and the nonprofit Michigan Institute for Contemporary Art began to explore opportunities for production. Tom Lietz conducted initial interviews with Hollister and Tadgerson, which would eventually expand to a series of 40 additional interviews with members of the business community, labor leaders, politicians, former GM executives, and others connected to the story. Throughout the process, a community advisory committee provided important access and feedback to the production. While these interviews captured the publicly-known story of the campaign, they also painted a dramatic picture of what happened behind the scenes, surfacing themes of collaboration in the face of crisis. The production also gained access to a rich trove of archival media, including thousands of hours of archival news footage, and box upon box of files from mayoral and Keep GM campaign archives. In 2014, MessageMakers completed post-production on the film, and it premiered at a private red-carpet event in Lansing, then screened for sell-out audiences at a number of film festivals. Second Shift will also screen as a featured presentation at a national labor relations conference. 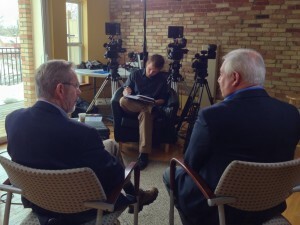 WKAR has committed to broadcast the film, and support its distribution to other PBS stations. The producers and advisory committee of Second Shift are currently in the process of developing an enhanced website, sequel film, and other materials that extend the story. David Hollister served as Lansing Mayor from 1993 to 2003, a time period during which he undertook several projects to benefit Lansing. One of his most memorable projects was convincing General Motors to build the Grand River Assembly Plant. When Hollister was informed that GM intended to pull production out of Lansing, his strong commitment to strengthening the local economy drove him to rally the many regional stakeholders and take whatever action was necessary to keep GM in Lansing. Former CEO and President of Capital Consultants (now C2AE), Ray Tadgerson served as the project director/manager for the Blue Ribbon Committee to Keep GM. Tadgerson, a professional engineer hired as a consultant by the Mayor and the City, facilitated creation of the strategic plan for the Blue Ribbon Committee and assisted co-chairs Dave Hollister and Jack Davis in managing the successful campaign. He also demonstrated to GM that a plant model used in Germany and Brazil could be built on the site of the then-existing Main Assembly Plant while continuing assembly operations at the plant. He then helped GM locate a site for the Lansing Delta Assembly plant. Terry Terry serves as president of MessageMakers and president and co-founder of Michigan Institute for Contemporary Art (MICA). He has also served on the Board of Directors of the Old Town Commercial Association, helping to revitalize Old Town in north Lansing. Tom is a hands-on storyteller. Over the past 14 years he has led production efforts on various feature films, shorts, and other pieces for commercial and non-profit clients. Growing up in the Lansing region, Tom first experienced the story of “Second Shift” as a member of the community.